Most of our insurance companies have the option for you to pay your premiums by EFT (Electronic Funds Transfer), e-check or by credit card. Fast online payments can prevent lapses in coverage and save you time. If you have any questions about your bill from the insurance company or would like to make a payment, you can select the insurance company below. They have extended hours and may be available when we are not. You can always contact our office to resolve questions concerning bills from your insurance company. 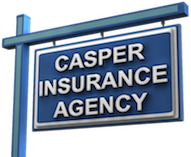 Casper Insurance is committed to providing you superior service.